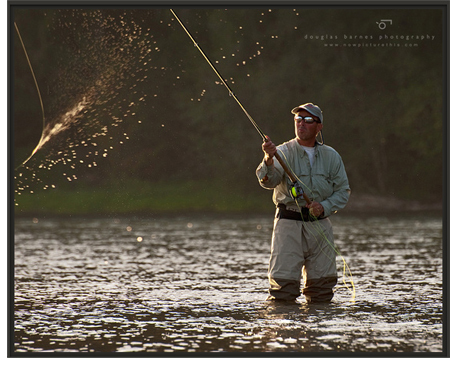 Now booking trips for Summer Steelhead and Sea-run Cutthroat on the Cowlitz River in Southwest Washington state. See my guided trips page for more info. We'll typically see Summer Steelhead return from July through mid/late October. 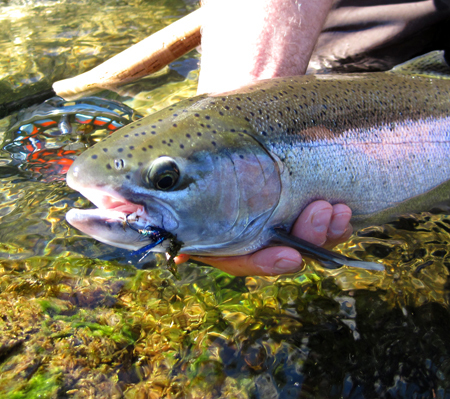 Sea-run Cutthroat return from early/mid September through mid/late October. Now is the time to get outside and improve your casting by practicing and/or taking a class so that you're better prepared when the fishing is hot. Private casting classes are offered year-round and make a great gift! If you're interested, please email mesteve@northwestflyfisherman.com and or see my Casting Instruction for more information. Over the past century, Washington's Native Salmon and Steelhead have continued to decline. As a result of this downward trend, 5 of 7 native steelhead stocks are now ESA listed. If we are going to salvage what is left of these fish, aggressive measures need to be taken to protect them. As human populations continue to grow, we continue to put more and more pressure on dwindling wild fish populations. I've heard the old argument "hey, I'm only one person, what effect can I have?" Well ...Multiply that same question by 7 billion. You are not alone on planet Earth! At this late stage of the game, EVERY FISH COUNTS! We need to be careful in managing fish populations so that future generations can enjoy them. Unfortunately, there are already extinct runs of steelhead and salmon in Idaho, Oregon, California, and Washington state. Please do all that you to minimize your impact. For more information regarding the status of Wild Steelhead, please visit The Wild Steelhead Coalition. My observations and first hand experiences as a guide, fly angler, and observer on the Olympic Peninsula over the 12 years has lead me to see the continued struggle that wild steelhead face. There numbers, region wide, have been declining for much longer. As a result of the continued downward spiral of these magnificent fish, I have discontinued guiding and fishing for wild steelhead. It has been two years since I fished or guided for wild steelhead in Washington. The rivers on the Olympic Peninsula receive between 1,000 and 2,000 winter steelhead annually. There are approximately 5-6 rivers that receive the bulk of the run - so roughly, 6-12 thousand fish. That's not very many. Wild steelhead generally return to their rivers of origin over a 6-8 week period. Of the few thousand fish that return, large percentage are netted. The fraction of fish that make it past the nets, are then pursued by anglers of all flavors. In Washington state, the law allows for a person to kill a wild steelhead. The small percentage of fish that make it past the nets are targeted by ever greater numbers of anglers, and this virtually assures their continued decline. It is my belief that these rivers cannot sustain even Catch and Release pressure. If one takes into account the thousands of anglers who pursue these fish, and considers how many fish enter the river systems, it is highly likely that very few make it to their spawning grounds without being touched, even by well meaning catch and release anglers. Everyone interested in pursuing wild steelhead ought to take a minute and read State of the Steelhead by Dylan Tomine which is on the front page of the Wild Steelhead Coalition to understand just how threatened these fish are. On a slightly different note but still related to the Olympic Peninsula - For a number of years, I was the only fly fishing guide to have a permit to guide within the Olympic National Park. Unfortunately, there are a few well known fly fishing guides who willfully/knowingly, guide without the proper permits. This is poaching and it must stop. If you're considering a guided trip within the National Park, please ask to view the guides permits - you are at risk of a heavy fine if you're caught with an unlicensed guide within the Olympic National Park. If you're traveling to Seattle, one thing you might see at Pike's Market and/or restaurants are "wild" steelhead on the menu. Unfortunately, these fish are dwindling. If you're concerned about preserving these magnificent fish, please avoid purchasing them and inform those restaurants that serve them that wild steelhead are too precious to be harvested. Along the same line, please avoid using those guide services that are not strictly catch and release for all wild fish. Unfortunately, in Washington state, an angler is allowed to kill one fish per season. However, because of the mismanagement of this resource over the past century or so, 5 of the 7 native steelhead stocks have reached ESA listing. Unfortunately, even the new Steelhead Management plan put out in the spring of 2009 still allows anglers to harvest fish. Please write to Washington Division of Fish & Wildlife and let them know that you do not support the continued harvest of these fish. Taking time to improve your skillset is always advisable. As people find themselves with limited amounts of time, it's imperative to maximize your potential while you're out on the rivers. If you're interested in helping yourself become a better caster, check out my Casting Instruction page. You'll be glad you did!